Speed thrills! Those with a passion with the 'fast and furious' machines, will know what it means. The undulating expanse of the Himalayas is where the 'rough and tough' men and their rugged machines haunt for that inimitable adrenalin rush. Ignite the tracks at..
Slice through the mountains on your hotwheels! A popular route is the Manali to Shimla track via Khardungla Pass (18,370 ft) - the world's highest motorable road - has lush grasslands, endless expanse of apple orchards, villages and steep climbs. Summers are the best time to venture. Another exciting track can be made near the Kanchenjungha, from Sikkim to Darjeeling with plush tea garden, snow capped peaks flanking your tracks. Another enchanting track can be from Mussoorie, with the backdrop of the Greater Himalayas, to Dhantoli where you can cycle through antique villages of Guptakashi, gurgling streams, highlands of Chopta in the Kedarnath musk deer sanctuary. En route, you can also halt at the pilgrimage hubs at Rishikesh and Hardwar. Tarai forests along the foothills of Nainital and the hill state of Himachal Pradesh have some lovely stretches for easy and smooth rides. 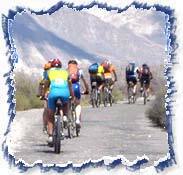 Your bike is roaring already and you are undecided - in that case, our tours can be your excellent itinerary optimizer. Our packages will be further replete with back-up vehicles, first-aid boxes, food and also tents for camping on request. Bikers perchance haven't checked Che Guevara's Motocycle Diaries, then do grasp a copy before you get, set, go! It is the real story of Guevara and his friends' exploration of North America on their antique hotwheels in their early twenties. The movie too is awesome!